Herbivores Are the New Carnivores – Olive For Greens. Healthy eating? Diet? Vegetables? “Yuck!” Yuck. That’s usually what people say when they hear those words. I used to fear those words myself. Is it because I am older that I no longer feel that way? perhaps- but I doubt it. I, more or so, like to think about it as a new lifestyle. Metaphorically, I threw away my old, dingy clothes and purchased new ones. Or traded in my 1987 Chevy for a new 2013 Toyota. Or stopped slouching and now walk upright. Okay! Enough of that. But in all seriousness when I adopted vegetarianism, I didn’t think I could do it. Frankly, I didn’t think I would last. I was looking to lose weight and so, I challenged myself. This “temporary fix” helped me become more creative in the kitchen. I already loved to cook. I used to watch the Cooking Channel and whatever meal was featured that day, I made for dinner. I once believed becoming a vegetarian would limit my food options, confine my cooking possibilities or, worse, all flavor would be stripped from my meals. No one likes to admit they are wrong. But I must confess… I was so wrong! I actually became more creative in the kitchen by using herbs I’ve never tried, or thought I’d ever try. Herbs and seasonings such as thyme, rosemary, dill, marjoram and turmeric were extremely foreign to me. Before, my outlook on food was essentially restricted and I had no idea that I was actually depriving myself. I am also tasting vegetable that I, obliviously, didn’t know exist. Who knew butternut squash and zucchini were so enjoyable and versatile? Better than tasting new foods, I am really tasting everything I put into my mouth. I feel like my taste buds hit a reset button and intensified from 5 to 10. Now, I use less salt and less sugar in my food and beverages. Things I did not like before, such as mushrooms and raw red peppers, I profoundly like now. I cannot explain it or really understand it but I am not arguing with this strange phenomenon. There are waves of vegetarians washing up on sure (shore, get it?!). To be more precise, a Study done by Vegetarian Times shows 7.3 million Americans are Vegetarians. An additional 22.8 Million Follow a Vegetarian-Inclined Diet. Feeling like an outcast is usually not a factor anymore because every other person is a vegetarian. Nowadays, unless you visit a food chain with extremely limited vegetarian options on the menu, you’ll feel comfortable. But even then, when visiting food chains, you can swap your meat for extra veggies for no additionally cost. Not too long ago I went to Applebee’s and saw a Chicken Portobello meal on the menu. When the waitress asked for my order I said “I’ll have the Chicken Portobello minus the chicken, double the Portobello.” I was almost embarrassed. However, instead of overreacting or making a funny face at my funny request, the waitress simple said, “Of course”. I was so relieved. It was then I realized that I was my own enemy and made a big deal of the situation in my head. I believe that Herbivores will be the new Carnivores and it will be the person at the table who order the 100% beef burger getting an eyebrow raise rather than the person who ordered the mushroom burger with extra onions! Some people say that Portobello’s replace beef. That could be true because of the depth and natural juices when cooked. I just like the taste. This is a versatile recipe that can be eaten as a sandwich, as a side or as a main dish with a salad. Combine first balsamic vinegar, garlic, salt, pepper and mushroom caps in a large zip-top plastic bag. Seal and marinate in the refrigerator for 30 minutes. Remove mushrooms from bag; discard marinade, reverse marinated garlic; place the mushrooms, cup side down, on a paper towel covered plate to release some moisture; Preheat oven to 400 degrees F.
Meanwhile, heat the oil to a skillet over medium flame. Then add the red peppers, onions, tomatoes, artichoke, olives, apple cider vinegar, marinated garlic, dill and oregano to the skillet. Sauté about 5 minutes. Add feta cheese then turn off the flame. On a greased baking sheet, place the mushrooms cup side up. Add the filling, top with bread crumb, if desired, then bake for 15-20 minutes. Tip: For the roasted red peppers- As the vegetable sauté on the stove, turn on the broiler and add the red peppers. Roasted no more than 5 minutes, or until the peppers are visibility roasted. Remove then add to the stove top ingredients. The red peppers don’t have to be roasted. Add to thick burger bun. Top with red onions, greens, even add a little ketchup and mustard if you like! 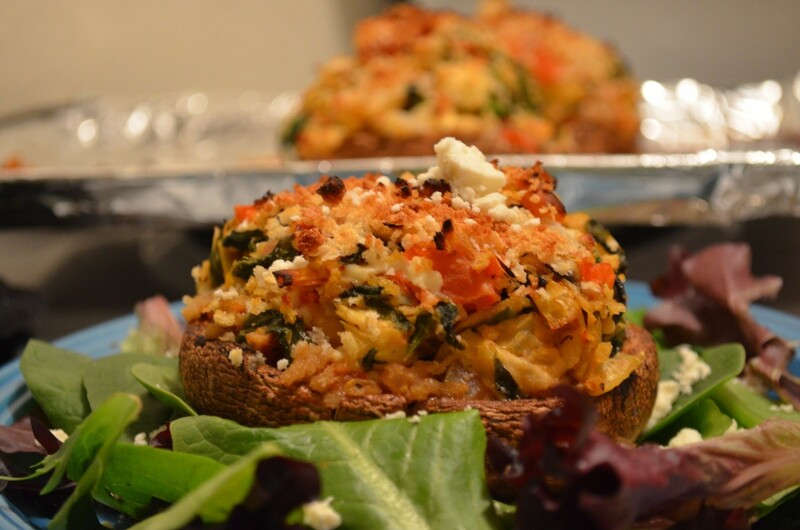 Serve on a bed of leafy greens or with a side of oven sweet potatoes. I love that vegetarianism and veganism is becoming more accepted in society! That is a great story at Applebees haha I would have never even thought to ask for that.